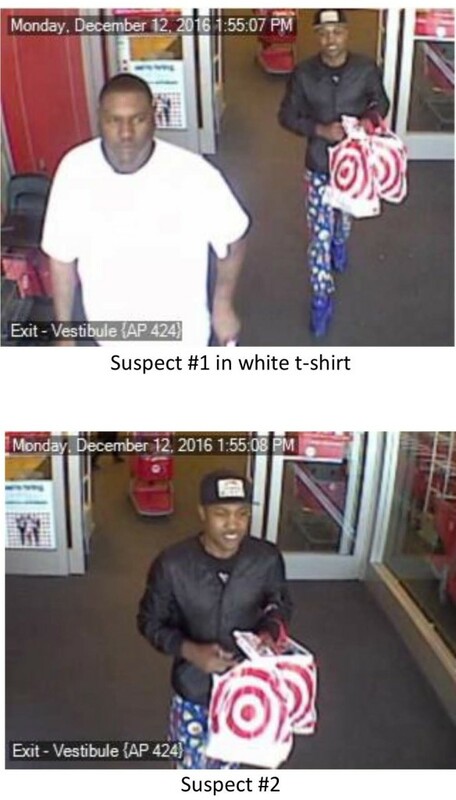 ENCINITAS — San Diego County Crime Stoppers is offering a $1,000 reward for information on two men wanted on suspicion of stealing credit cards and identity theft. A wallet that contained numerous credit cards was stolen from a locker an unknown suspect or suspects broke into at the L.A. Fitness on 201 S. El Camino Real on Dec. 12. The credit cards were later used fraudulently at the Target store at 1010 N. El Camino Real. The two suspects to have used the cards are described as African-American males. One was last seen wearing a white t-shirt and blue jeans with a medium build and short hair. The other suspect was last seen wearing a black jacket, black baseball cap with white print on front, blue jeans with doughnuts printed on them and blue shoes. If you recognize the suspects or have information about this crime, call the North Coastal Sheriff’s Station at (760) 966-3500 or the Crime Stoppers anonymous tip line at (888) 580-8477. Crime Stoppers is offering up to a $1,000 reward to anyone with information that leads to an arrest in this case. Anonymous email and text messages can be sent in via sdcrimestoppers.org .